Receiving at least 100 calls per day, up to 300 some day. Claims "Senior staff member" from A.G.'s told his chief of staff office would lose ability to use LTC system to enforce child support. Staff "deleted over 400 voicemails" the other day. AG office rep testimony begins at 8:50 mark. 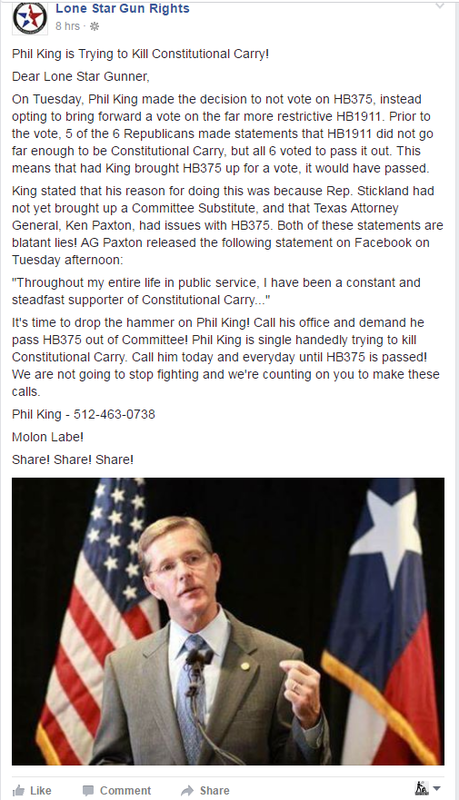 AG rep: "While it is the default setting of the agency to raise concerns any time a bill draft is in conflict with current law, or current practice...in the case of HB 375 [Stickland's bill] the agency is prepared to forego those concerns and continue to be the nation's #1 child support enforcement agency without that tool in our toolbox." Lone Star Gun rights has more here. The merits and political peril of the Buffett bill bad enough that it was an easy call to join the statewide leadership letter denouncing it. Making matters that much better, we just came across an abortion related angle that, honestly, has to be seen to be believed. But we can assure you, it's very real. It's not a secret that Buffett is a gigantic liberal and, as such, it's also not a secret that Buffett has donated over a BILLION dollars to pro-abortion groups (primarily, but not limited to, Planned Parenthood) over the decades. But...did you know there's a Texas-specific angle?!? 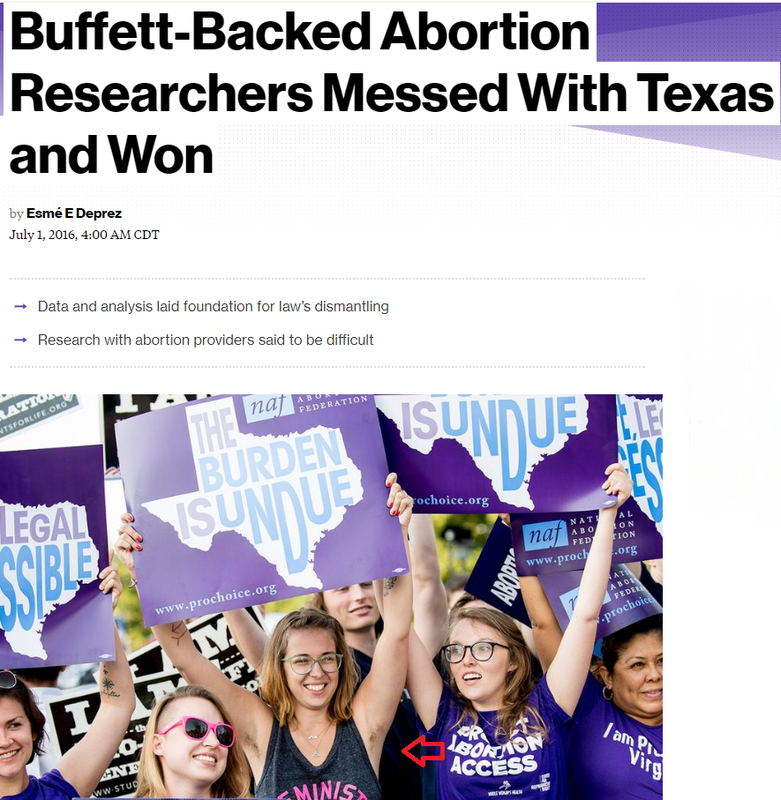 The Texas Policy Evaluation Project, known as TxPEP, assigned five researchers to traverse the state to gather statistics from abortion providers, amass public records and interview women. The project was founded in 2011 at the University of Texas at Austin to study the impacts of reproductive health measures passed by state lawmakers. Its work was enabled by funding from the Susan Thompson Buffett Foundation, named after Warren Buffett’s deceased first wife. A University of Texas program is being lauded by liberals for helping undermine in court the Lone Star State’s safety-focused laws regarding abortion. Given the role the program has played in undermining commonsense laws, it is another example of a tax-funded institution working against the taxpayers. The Texas Policy Evaluation Project (TxPEP) is a UT program to study the “impact” of legislation on “reproductive” issues. This entity has yet to find a limitation on abortion or abortion providers it didn’t hate, because it was designed to provide academic cover for tax-funded abortion services. An agency of state government, UT’s pro-abortion project was funded by left-wing billionaire Warren Buffett. While TxPEP claims to be privately funded, it operates under the auspices of the University of Texas. 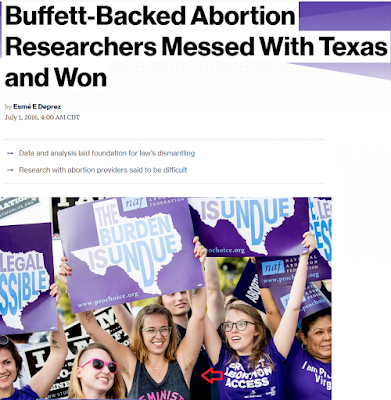 This gives the pro-abortion advocates running it – one “researcher” formerly headed an abortion services program in Massachusetts – both an easy tax shelter for liberal donors (like Buffett) and legitimizes their findings. And how do our allegedly conservative Texas Senators, in their first session since the 2016 SCOTUS decision, address the role Warren Buffett played in undermining Texas' pro-life laws?!? Apparently by arraigning special regulatory favors for Buffett's business interests (all while killing the pro-free market bill that would have addressed Buffett's concerns without special privileges). Bottom Line: This boggles the mind, but it's really happening. 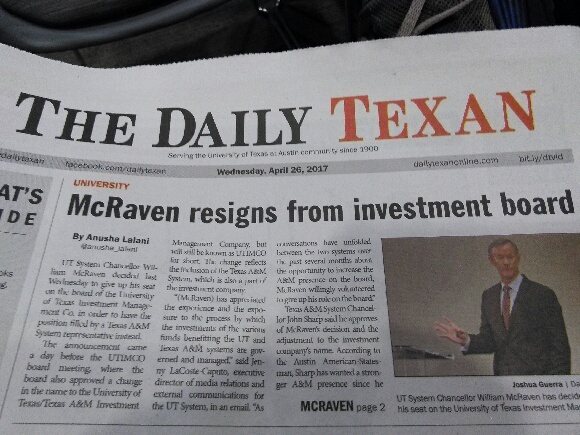 UT System Chancellor William McRaven decided last Wednesday to give up his seat on the board of the University of Texas Investment Management Co. in order to have the position filled by a Texas A&M System representative instead. The announcement came a day before the UTIMCO board meeting, where the board also approved a change in the name to the University of Texas/Texas A&M Investment Management Company, but will still be known as UTIMCO for short. 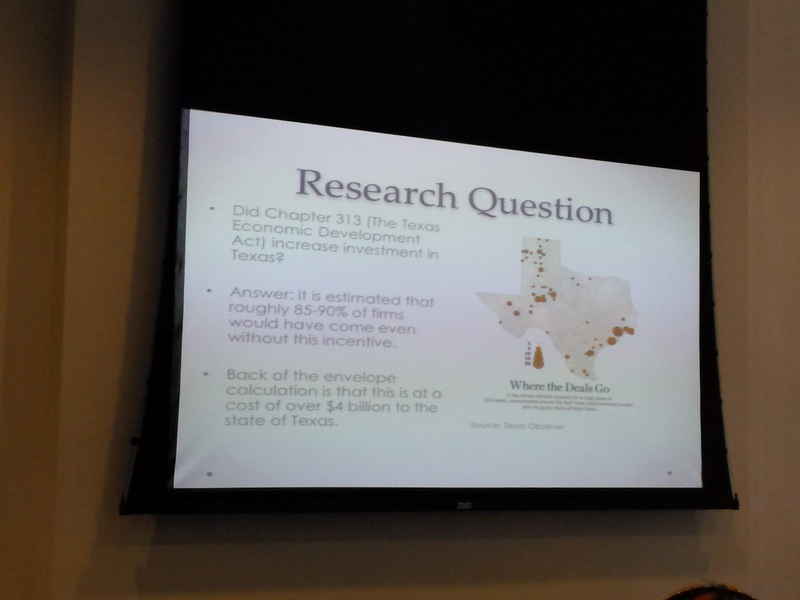 The change reflects the inclusion of the Texas A&M System, which is also a part of the investment company. Texas A&M System Chancellor John Sharp said he approves of McRaven’s decision and the adjustment to the investment company’s name. According to the Austin American-Statesman, Sharp has wanted a stronger A&M presence since he became chancellor in 2011. 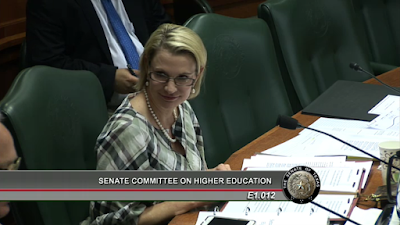 Under state law, the UT System Board of Regents will appoint an A&M System representative. 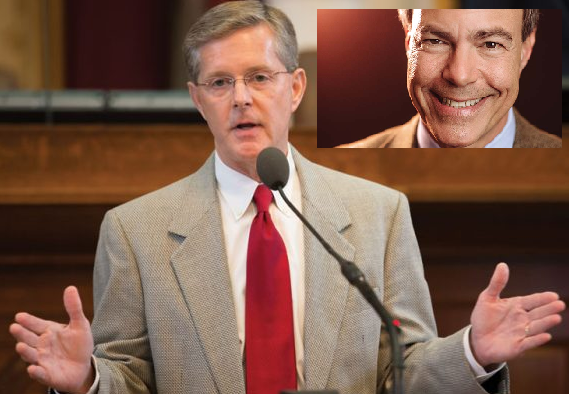 UT System Regent Kevin Eltife told The Daily Texan that A&M deserves to have more representation in the investment company because the decisions made impact A&M’s System. 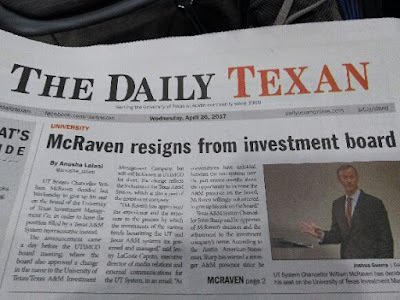 McRaven’s decision to step down from UTIMCO comes shortly after he discontinued his plans for a data center in Houston, which caused controversy in the Texas Legislature. However, LaCoste-Caputo and Eltife said McRaven’s removal from UTIMCO’s board and the Houston land purchase are unrelated to one another. Keep in mind, this comes on the heels of the UTIMCO CEO's sudden resignation on a holiday afternoon late last year. While we have no specific knowledge, we've been suspicious of all subsequent news coming out of UTIMCO. We made this exact point during our testimony in the last regental confirmation hearing. That being said, it's also plausible in this cast that there's nothing more to this than the publicly stated reason of giving a bigger voice to A&M. Bottom Line: It's impossible to know what this means, but it's a situation worth monitoring. Relating to the exclusion from total revenue of certain payments received by health care providers for purposes of computing the franchise tax. Relating to the authority of certain municipalities to pledge revenue from the municipal hotel occupancy tax for the payment of obligations related to hotel projects. Relating to a franchise tax credit for enterprise projects for certain capital investments. Relating to the authority of certain municipalities to pledge certain tax revenue for the payment of obligations related to hotel projects. HB 1682 Bohac | et al. Relating to the sales and use tax exemption for the repair, remodeling, or maintenance of aircraft. 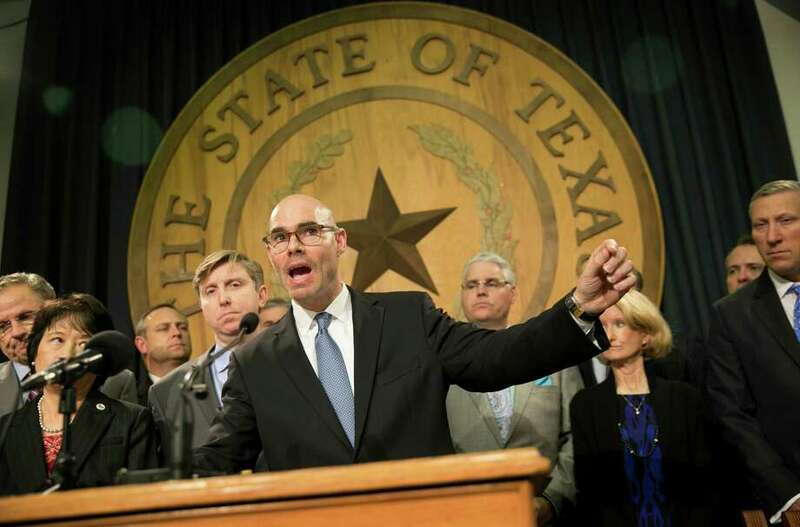 HB 1721 Bonnen, Greg | et al. Relating to an exemption from and a limitation on the sales tax imposed on certain boats and boat motors. HB 2182 Reynolds | et al. Relating to the exemption from taxes and special assessments of property of a navigation district. Relating to an election to reduce or increase the sales and use tax rate imposed by a municipality for the benefit of a Type B development corporation. Relating to the designation of a well as a two-year inactive well or three-year inactive well for purposes of the oil and gas severance tax exemption. Relating to a sales and use tax exemption for certain cleaning services performed for a health care facility. Relating to a franchise or insurance premium tax credit for low-income housing developments. Relating to the use of revenue from municipal hotel occupancy taxes for a sports facility or field in certain municipalities. 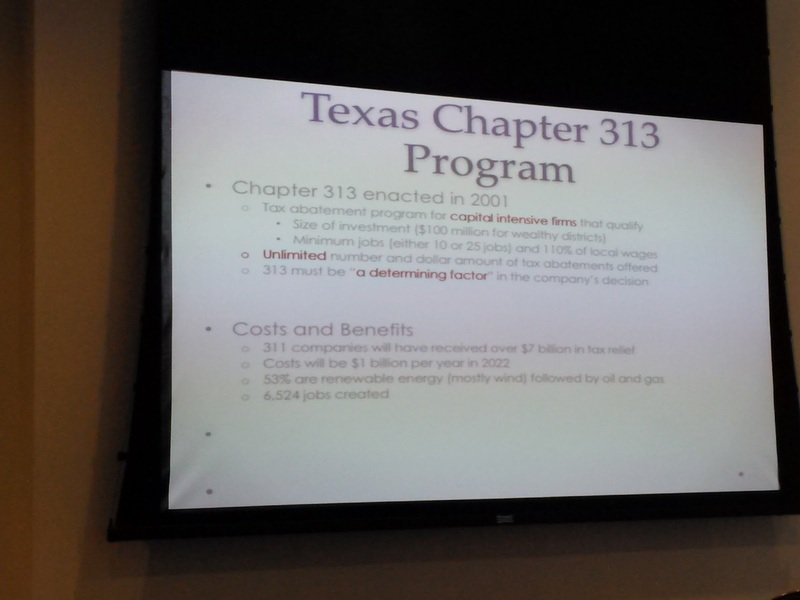 How ineffective is one of Texas' largest corporate welfare programs?!? 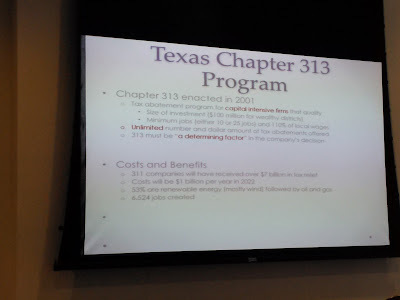 We've previously discussed the "Chapter 313" incentive program whereby the state reimburses local school districts for property tax abatements. 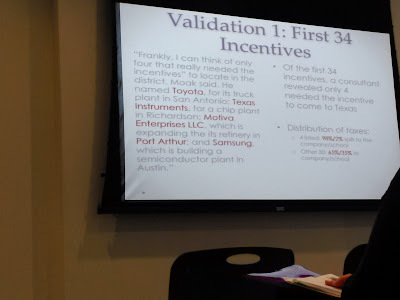 We've also discussed UT professor Nathan Jensen's work on various 'economic development' programs. This afternoon, at the UT Center for Politics and Governance's event "Economic Development in Texas: The Impact of Chapter 313" Professor Jensen gave an update on his research into the program. The biggest top-line takeaway is that at least 85% of the projects where 313's were used would have happened anyway. In other words, the subsidy did nothing to create new economic activity (Note: Duh). It merely re-distributed resources from taxpayers to the politically connected without accomplishing anything. Another interesting factoid is that a small group of consultants are putting together the overwhelming majority of 313 applications around the state. One consultant, by himself, put together close to 200. This is a classic case of concentrated costs and diffused benefits. Furthermore, besides getting "made whole" by the state for the abatements, school districts are also frequently eligible for 'supplemental' payments outside of the school finance formula. Thus, school districts make money on these deals. That's why companies are almost never told no. Over 90% of companies get incentives from multiple programs. 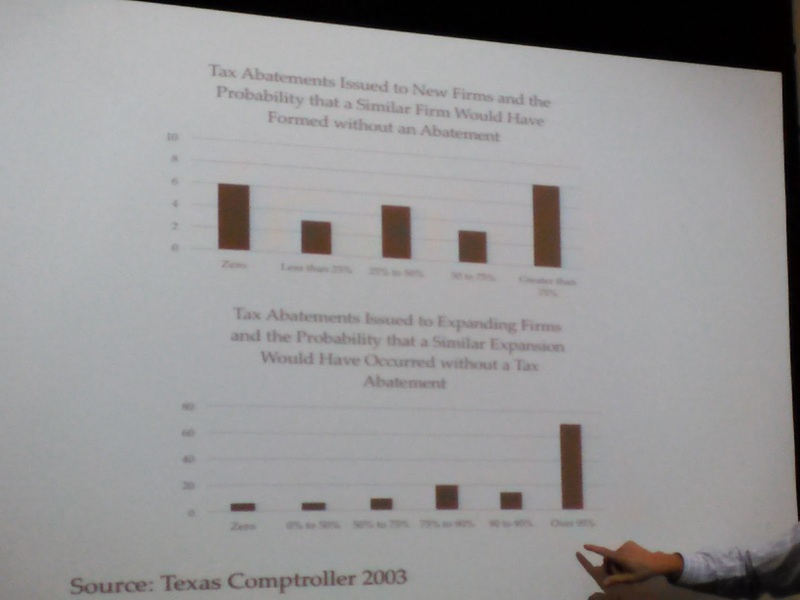 Texas' property tax system is prohibitive for large capital investments. 53% of 313 agreements go to 'renewable' energy (primarily wind with some solar). ie. All those giant wind farms in West Texas and the Panhandle. Bottom Line: The legislature needs to abolish this nonsense. "When they heard this, they were furious and plotted to kill them." As national headlines can attest, the assault on free speech on college campuses has gotten significantly worse in recent years. In response, several states have passed bills to protect speech on campus. 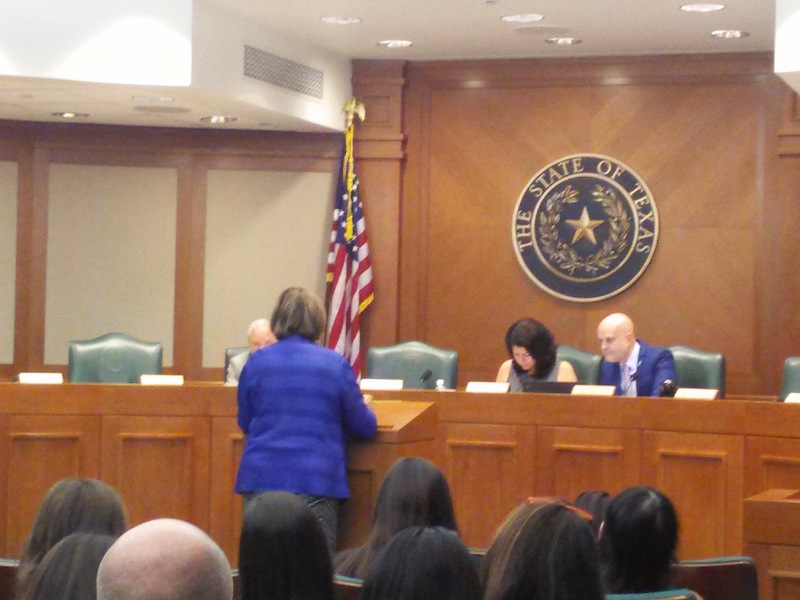 This morning, we attended a hearing for, and testified in favor of, Texas' equivalent attempt to do so. SB 1511 (Buckingham) would prohibit "free speech zones" on campuses. It would prohibit universities from punishing students based on political ideas. It would also prohibit public universities from disinviting speakers based on the political content of their ideas. TPPF's Tom Lindsay testified in favor of the bill and recited a litany of abuses against students holding views contrary to the bureaucracies that run these institution. We largely echoed Dr. Lindsay's views, while also highlighting the mess that occurred with YCT's affirmative action bake sale at UT last year. To be honest, we think the national headlines speak for themselves. But there's one point we made in testimony about which we want to elaborate here: The biggest problem is that the Boards of Regents aren't doing their jobs to protect students. If the legislature wants free speech on campus protected, they've got to stop rubber stamping Regent appointments, otherwise they're going to gut this law the same way they gutted campus carry. It's not a coincidence that we made this exact point during our testimony for the last round of UT regents. During dais discussion, Chairman Seliger tried to claim that the first amendment renders this bill superfluous. Kirk Watson came up with a serious of cute lawyer distinctions designed to show that the bill was unnecessary. Seliger and Watson both chimed in to claim that the bill is toothless and thus unnecessary. Unfortunately, according to a Senate source, Senator Buckingham had to remove most of the teeth from the bill to get it a hearing in the first place; thus Seliger is talking out of both sides of his mouth on this issue. Bottom Line: This bill won't get to the Governor's desk this session, but we commend the Senate for starting the conversation because we have a feeling political correctness in public universities is going to get a lot worse. While the "Senate good/House bad" narrative can be a bit of an oversimplification, the product of yesterday's respective floor sessions speak for themselves. Campbell's bill would abolish involuntary annexation at the municipal level. Involuntary annexation is a bad idea that has grown increasingly abusive in recent years. This continues the Senate's trend this session of cracking down on municipal nonsense. Relating to the regulation of commercial shrimp unloading; requiring an occupational license; authorizing a fee. Bill creates new authority for unaccountable taxation from unelected bureaucrats. Occupational licensing is a barrier to entry. Violates RPT platform; we should be repealing occupational licensing not creating new ones. 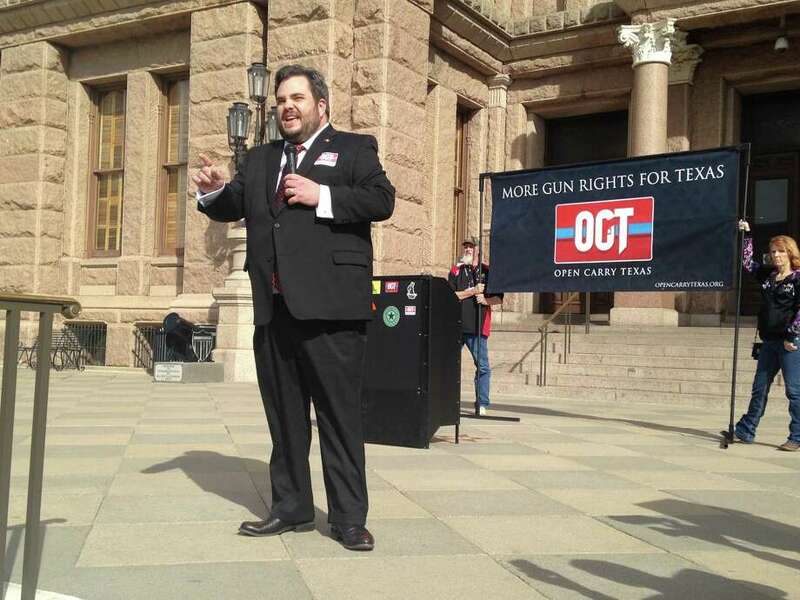 Stickland offered three amendments that would have solved the problem Phelan's claimed his bill was attempting to address in a free market manner. Unfortunately, all three were overwhelmingly voted down. Thus did the House put itself on record supporting fewer jobs and higher cost of living. Bottom Line: Honestly, the difference between these two bills speaks for itself. #TXLEGE: Statewide grassroots leadership invites Warren Buffett to join Free Market auto sales coalition!!! Bottom Line: One of two things needs to happen. If this bill can be amended to include direct sales for everyone, that would be fine. Otherwise, this bill needs to die. 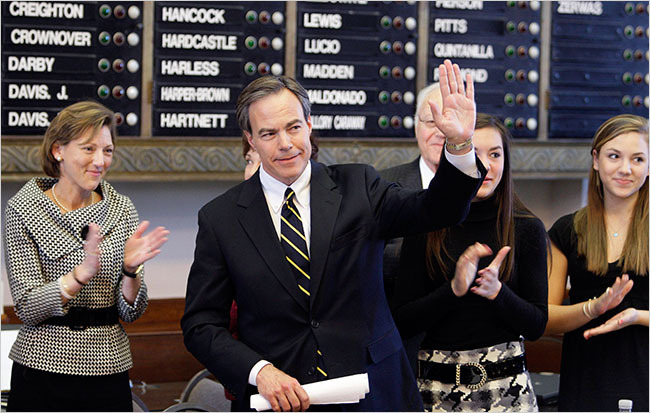 As a veteran local lobbyist joked recently, the only thing standing between Texas and the Middle Ages is the House, ably presided over by Speaker Joe Straus, Republican of San Antonio. In contrast to the Senate’s far-right agenda, the House’s common-sense priorities include remodeling our outdated school finance system and advancing mental health reforms. It remains to be seen whether moderates in the House have the votes to stop all the bad bills coming their way from the Senate. 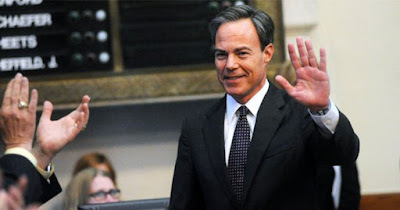 Bottom Line: While the "Senate good/House bad" narrative can be a bit of an oversimplification at times...Joe Straus is the only person at the Capitol being praised in the New York Times. Bottom Line: If Phil King wants to be the guy who kills Constitutional carry, that's his business, but that doesn't stop activists from leaving everything on the field. Whoa, whoa...wait a second...sssay whaaaaaat?!? A couple of years ago, famed billionaire Warren Buffett got into the auto dealer business without realizing a protectionist state law could stop him from selling cars in Texas. On Monday, Buffett met with Lt. Gov. Dan Patrick and — according to multiple Capitol sources and an unchallenged news story — Gov. Greg Abbott. On Tuesday, the Texas Senate used emergency powers to introduce what was quickly dubbed the “Buffett Bill,” Senate Bill 2279, granting the Oracle of Omaha a special exemption. On Wednesday the author set the bill for a public hearing in a Senate committee. And on Thursday it shot out of the panel like a lightning bolt toward the Senate floor. In Capitol parlance, what Buffett is getting is known as a “carve-out,” a special deal for one company. In the case of Buffett’s Berkshire Hathaway Automotive, it was an exemption from the supposedly hallowed rule that vehicle manufacturers can’t be vehicle dealers. Berkshire Hathaway also owns an RV manufacturer, Forest River Inc., in Indiana. If the Legislature fixes Buffett’s problem, it won’t be the first time lawmakers have come to the aid of powerful interests. What makes the Buffett carve-out extraordinary is the speed with which it passed through the often clunky legislative process, the powerful auto dealer alliance supporting it and the stark contrast with other attempts — including by electric car maker Tesla Motors — to open up the state’s heavily-regulated auto market. The special treatment for Buffett’s bill also lays bare the tensions between the statewide political establishment — led by Abbott and Patrick — and the drain-the-swamp grassroots that have helped put them in their current jobs. 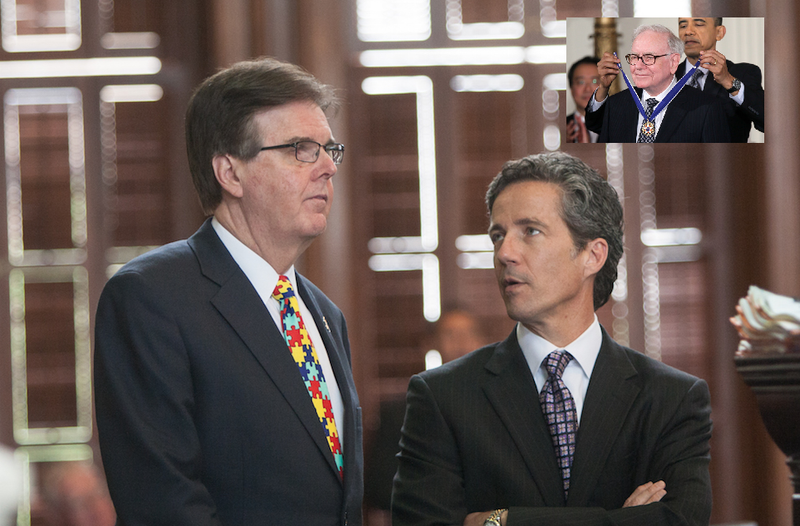 Economic protectionism is a touchy subject in the offices of the governor and lieutenant governor, neither of which answered questions about the Buffet Bill or the auto dealers’ firm grip on the Texas Legislature. Patrick’s office did confirm he met with Buffett. A bill being pushed by Tesla Motors — arch enemy of an auto dealer network that has pumped millions into the campaign coffers of Abbott and others — is heading into oblivion faster than the company’s sleek Model X. The Tesla bill hasn’t even gotten a public hearing, and nobody in the know at the Capitol is predicting the bill will go anywhere even if it does. That leaves Texas increasingly isolated from other big economies that have embraced the direct-to-consumer sales model Tesla has pioneered around the world — including in approximately 30 U.S. states. But Tesla represents a direct threat to auto dealers because the bill would allow any manufacturer — not just the electric carmaker — to bypass car dealers altogether and sell directly to consumers. And a threat to auto dealers is a threat to the establishment. In recent years, auto dealer interests, led in large part by one of Abbott’s largest donors — Houston billionaire Dan Friedkin of Gulf States Toyota — have poured money into the campaigns of the state’s top elected officials as part of a well-financed fight against Tesla, according to a 2015 study by Texans for Public Justice, a liberal watchdog group that tracks money and influence. 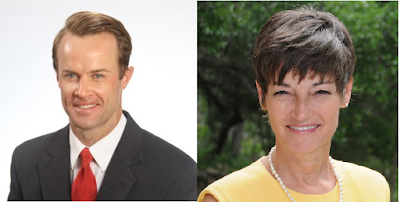 Auto dealer interests have given nearly $11 million to state politicians between 2013 and 2016, with Abbott and Patrick, respectively, at the top of the heap, according to preliminary TPJ figures. As it turns out, Friedkin, whom Abbott appointed to the board of the Texas Parks and Wildlife Department, has his own carve-out of sorts. His company is the exclusive distributor of Toyotas in Texas and four other states — while also having ownership interests in dealerships. Friedkin's business empire might have run afoul of state laws designed to stop both manufacturers and distributors from becoming dealers themselves. But Carroll Smith, chairman of the Texas Auto Dealers Association, said Friedkin was cut out of the law because he had pre-existing dealerships when the bills were passed more than a decade ago. It's known as the "Friedkin exemption." So...a liberal billionaire who helped raise money for Obama and Hillary Clinton visits the Capitol and a "narrowly tailored" bill starts moving while the bill that repeals the entire law in question languishes in committee?!? In fairness to those pushing the bill, an argument can be made that RV's and consumer automobiles are fundamentally different businesses and that a law intended to cover the latter shouldn't apply to the former. Then there's the issue of what's politically feasible. It isn't a crazy argument, but it is incredibly weak. It's also the type of argument we normally hear from the House...but this time we're hearing it from the Senate. For the most part, this session, the Senate has been moving the ball in the right direction. While we certainly don't agree with every action they've taken, it's hard to deny that they're considering and passing bills that deliver tangible progress on a wide range of priorities. From property taxes, to taxpayer funded lobbying, to corporate welfare on the local level, to dismemberment abortion, to university tuition, to sharing economy issues, to any number of other issues, if the bills working their way through the Senate cross the finish line they will represent tangible (if imperfect and incomplete) progress. And, similarly, the contrast with the House speaks for itself. But if they press forward with a carve out bill for a liberal Obama donor while killing a much stronger free market bill that addresses the same issue, it doesn't take a genius to see how it would be used against them. The (basically accurate) Senate good/House bad narrative becomes muddied and more difficult to explain. This becomes even truer if Straus ultimately kills this measure. We spent several hours this morning working Senate sources and, to the best of our knowledge, nobody seems to have any clue what's going on besides Dan Patrick and Kelly Hancock. That's both a bad thing and a good thing. It's bad because it's incredibly shady but it's good because it suggests that, in the club-like atmosphere of the Senate, there doesn't seem to be consensus among the members to move forward...yet. One silver lining: If this bill does move forward, it's vulnerable to a floor amendment that could substitute the Tesla bill for the "Buffett bill." All it would take would be to have a Senator force the vote during floor debate. But we've also learned from experience that courage from an individual Texas senator is...fleeting. Bottom Line: This is...difficult to understand. Relating to the use by certain municipalities of hotel occupancy tax revenue to improve or expand certain airports. Relating to the use of municipal hotel occupancy tax revenues in certain municipalities. HB 1494 Morrison, Geanie W.
Relating to the use of municipal hotel occupancy tax revenue by certain municipalities. Relating to the exemption from ad valorem taxation by a school district of certain property used to build low-income or moderate-income housing. Relating to the authority of certain municipalities to pledge certain tax revenue for the payment of obligations related to certain projects. Relating to the use and allocation of municipal hotel occupancy tax revenue in certain municipalities. Relating to the use of municipal hotel occupancy tax revenue in certain municipalities. Relating to the use of municipal hotel occupancy tax revenue for sporting-related facilities in certain municipalities. Relating to authorizing certain counties to impose a hotel occupancy tax and to the purposes for which that tax revenue may be used. Relating to the use of municipal hotel occupancy tax revenue for homeless assistance programs. Relating to the authority of certain municipalities to use certain tax revenue for certain projects and to pledge that revenue for the payment of obligations related to those projects. Relating to the definition of eligible central municipality for purposes of the municipal hotel occupancy tax. HB 3838 Zerwas | et al. Relating to the use of municipal hotel occupancy tax revenue to construct, enhance, upgrade, and maintain coastal sports facilities in certain municipalities. Relating to the portion of the municipal hotel occupancy tax revenue collected in certain cities that can be utilized to promote the arts. 19 amendments...with 12 by Democrats?!? At 10 minutes per amendment, that's 190 minutes. That's more than three hours. 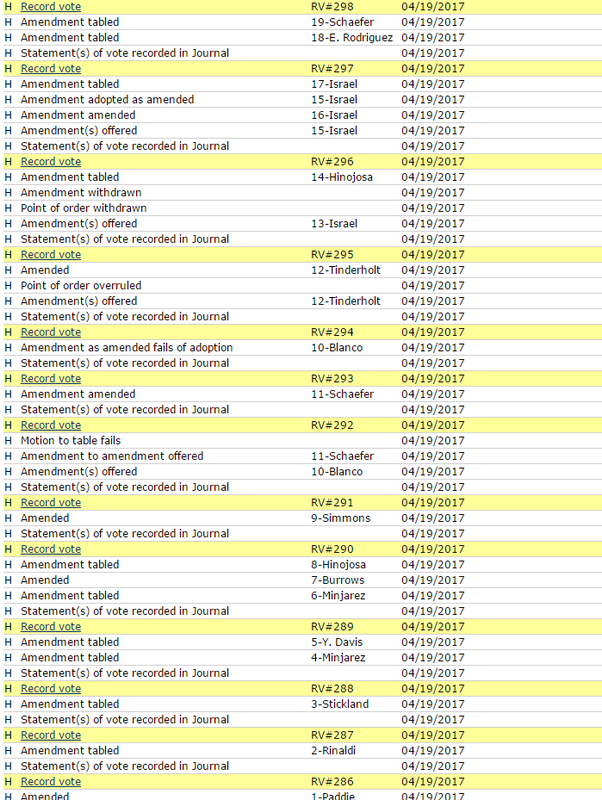 And several of the amendments took closer to 20. All afternoon long, we've been wondering why the Democrats were spending so much time on this bill. This is even more true once you consider that the House is also holding floor debate today on a major school finance bill (Note: We don't want to get sidetracked on school finance, but that bill is a whole separate hot mess). 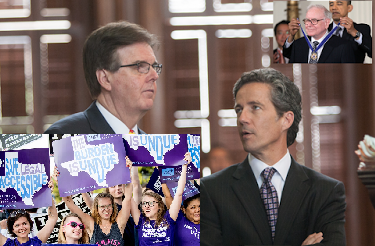 Considering that most of the Democrat amendments came from the Austin delegation, we assumed they were attempting to protect the city and the broader local government mafia. Making matters weirder, the debate morphed into a discussion of "discrimination." HB 2899 Simmons | et al. Relating to the regulation of discrimination by political subdivisions. That's the House equivalent of the privacy act. They're debating two major bills on the floor today, both of which are accompanied by lots of amendments. And they're taking their sweet time with those amendments. They're doing this to delay the start of tonight's state affairs hearing. 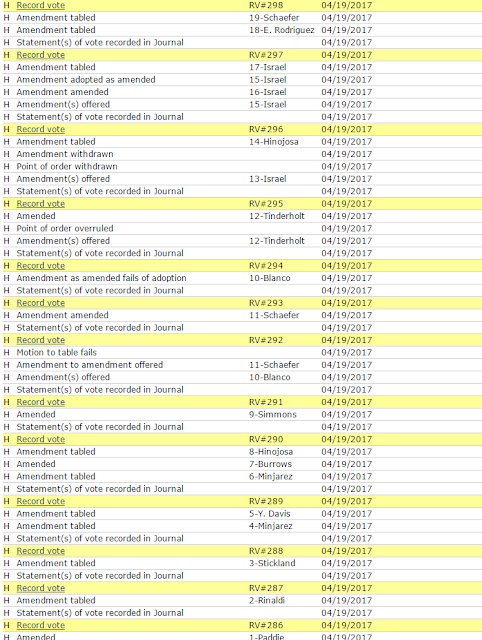 Consider further that Austin Democrat Celia Israel offered five of those amendments...and wasn't Celia Israel also the one who introduced the phrase "Operation Slowdown" in the first place?!? This isn't about ridesharing, it's about telegraphing what they're going to do with the privacy act. And we doubt they get off the floor before 9 pm tonight...which means the hearing begins around 10...and there are 10 total bills being heard. Bottom Line: Tonight is going to be a late night, and that late night was pre-planned. Meanwhile, the House just wrapped up hearing their companion bill; to be honest, the House hearing was more of what anyone who's been following this debate has come to expect. Supporters of the bill shared stories of small scale entrepreneurship and the benefits to their families and communities that resulted. The attacks on their property rights threatened those accomplishments. 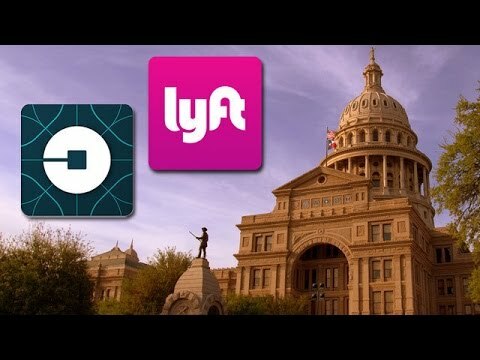 After being attacked by cities like Austin and Ft. Worth, they're coming to the legislature for help. 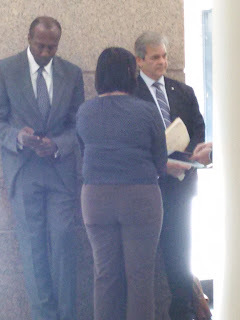 Mayor Adler testified against the bill and attempted to obfuscate the difference between owner occupied and owner offsite short term rentals. While only the latter are fully banned, Austin's ordinance imposes many of the same requirements on owner occupied units. For example, the limitations over how many people can be present on the property applies regardless. Of course, Adler knows this and he was attempting misdirection with the community. In addition to his suggestion to the Mayor that Austin eliminate zoning entirely, we enjoyed watching Representative Gary Elkins school the Mayor on property rights. Mayor Adler was joined in opposition by hotel industry trade associations, taxpayer funded lobbyists, and 'urban planning' professionals. There were also a couple of local Austin homeowners who shared horror stories about being next to bad STR properties. While we understand the awfulness of the situation they faced, that doesn't change the fact that the issues with which they dealt could have been addressed by enforcing the noise/nuisance ordinances the city already had on the books. We testified about the frightening enforcement powers the City of Austin claimed for itself out of thin air. The Austin STR ordinance empowers the city code department to perform warantless searches on any property they suspect of being a type-2 STR at any time with no warning. Note that we didn't say the police department has this authority (which we also wouldn't support, but for which we could see a justification)...we said the code department. It doesn't take a genius to see how this this type of authority could grow into something really dangerous. Likewise, in a committee with a Democrat chair (Carol Alvarado), it seemed prudent to mention that in the wrong hands this type of authority could be used in a racially discriminatory way. Bottom Line: We'll have to see what happens, but these bills are far enough in the process that there's still time. Yes, even the wicked for the day of doom." Bans cash transactions. Presumably, the state is interested in keeping records of all transactions for taxation purposes. Bans large vans and sports cars. All vehicles must have four doors, and a seat capacity of no more than eight. Mandates government-run background checks. Rather than allowing the company to run checks on its employees like most companies in America, this bill mandates each employee be submitted to local, state, and federal background checks. Interestingly, some of the same Republicans who oppose universal background checks on gun sales over privacy concerns are supporting this bill. Interferes with internal disciplinary measures. If a driver is even accused of driving while intoxicated, the bill mandates that he or she be locked out of the system until an investigation has been completed. But additionally, it requires the investigation records be kept on file for two years after the incident. Requires dangerous pick-ups. The bill requires drivers to pick up anyone soliciting a ride, regardless of what part of town they are in. If a driver has reason to avoid certain areas, he or she will have the choice to go there or face a penalty. Requires companies to direct riders to competitors. If a rider is physically disabled, and the ride-share company cannot provide a wheelchair accessible vehicle, under this bill, they will be required to find another company that can, and direct the rider to that business. In addition to the criticisms listed above, LSV also raises concerns about a $5000 fee TNC's will have to pay to the state. In the abstract, we agree with these criticisms. 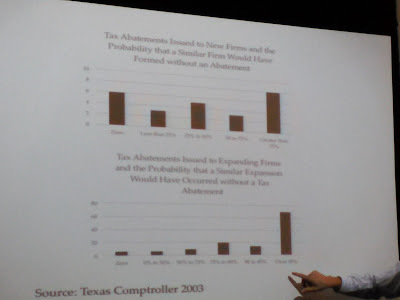 There's a reason why SB 113 (Huffines) is the only bill on which we testified in favor. But we don't live in the abstract...and we see nothing in the bill that's a dealbreaker. It's the difference between obnoxious regulation (bad but not disqualifying) and something truly awful and unworkable (eg. the Austin ordinance). (3) obtain and review the individual's driving record. As a point of comparison, we would excerpt the similar provision from the Austin ordinance, but it's three pages. You can read it for yourself here. We might not be crazy about either, but there's a significant difference between using one paragraph to set a broad requirement with wide leeway for how to fulfill it compared to three pages micromanaging the entire process. The fact that the House bill is 3.5 pages, compared to 12 pages for the Austin ordinance, is revealing. And that's before you consider that TNC trips often cross jurisdictional boundaries, so that standardization is beneficial in and of itself. It's not a secret that the Texas legislature's commitment to free enterprise is...conditional at best. It would be nice if that weren't the case, but it is. Given the underlying reality of who controls the legislature, we fail to see how HB 100 is anything other than a significant step in the right direction. In terms of letter grades, we'd give the House bill a "C." While we'd give the Huffines bill an "A," we'd also give these local ordinances an "F." In a choice between living in a "C" reality or living in an "F" reality, we'll choose the "C" reality. Bottom Line: This isn't the bill we would have written, but we see nothing disqualifying.